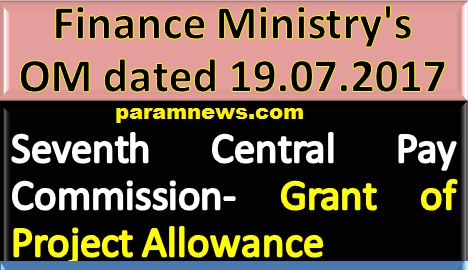 New Delhi, 20 July 2017: Ministry of Finance, Department of Expenditure has issued Office Memorandum on 19th July regarding implementation of the recommendations of 7th Central Pay Commission - Construction Projects - Grant of Project Allowance. The term ‘Pay Level’ in the revised pay structure means the ‘Level in the Pay Matrix. In respect of those employees who opt to continue in their pre-revised pay- structure, corresponding Grade Pay in the prescribed pay band as indicated in CCS (Revised Pay) Rules, 2016 would determine the allowance under these orders. These rates shall increase by 25 per cent whenever the Dearness Allowance payable on the revised pay structure goes up by 50 per cent. All other terms and conditions governing the grant of this allowance shall remain unchanged. These orders shall take effect from 1st July 2017. These orders shall also apply to the. 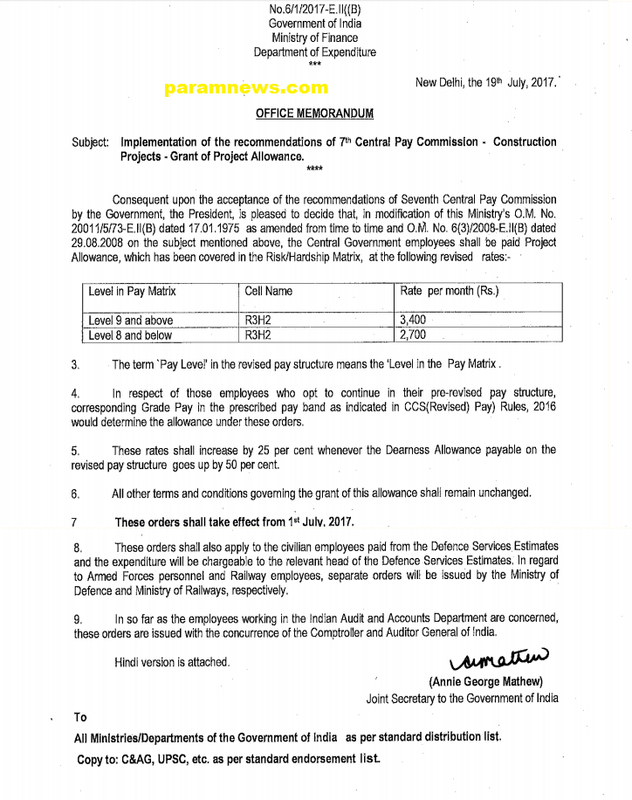 civilian employees paid from the Defence Services Estimates and the expenditure will be chargeable to the relevant head of the Defence Services Estimates.In regard to Armed Forces personnel and Railway employees, separate orders will be issued by the Ministry of Defence and Ministry of Railways, respectively. In so far as the employees. working in the Indian Audit and Accounts Department are concerned, these orders are issued with the concurrence of the Comptroller and Auditor General of India.